Our range of products include chemical glass dimple thermometer. We are engaged in manufacturing and supplying of a wide range of Thermometer Chemical Glass Dimple. These are the simple hygrometers for measuring the relative humidity level of the closed or open areas. Simple hygrometers also called as psychrometer consists of two thermometers. Each thermometer of a psychometer has a bulb,which measures the humidity levels of air at two different conditions(dry or wet). 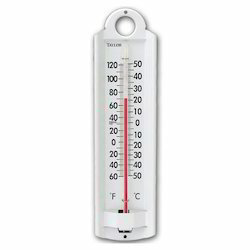 Looking for Thermometer Chemical Glass Dimple ?